Want to know who will win today’s match? Welcome to crix11.com. In Today’s Dream11 Fantasy Cricket Prediction of MI vs SRH 23rd T20 Match IPL 2018 we will cover playing 11, pitch report of Wankhede Stadium, Mumbai, best team for dream11, what astrology has to say on the toss. We will also cover players recent and past performance, weather report of Mumbai, dream11 guru prediction, latest news related to SRH vs MI 23rd match, the best choice for captain and vice-captain, key players, where to watch the live cricket match and details of live streaming. The above details are gathered by doing deep research, so make sure to read the whole post to get 100% benefit. The details are absolutely FREE and you don’t have to pay a single penny for this. Where Can You Watch the Live Streaming of MI vs SRH or Channels to Watch? Who Will Win the 23rd Match of IPL 2018 Between MI vs SRH and Toss Prediction? What is the best combination of players for Dream11 23rd Match? Date: The match will be played on 24th April 2018 (Tuesday). 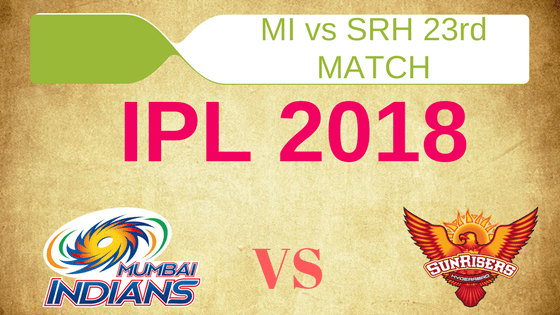 Match: Indian Premier League, SRH vs MI, IPL 2018. Wankhede pitch is good for stroke play. It has an even bounce and the batsman can trust the bounce and can play on the rise shorts. In short, the pitch will be a batting friendly pitch. Initially, the seamers may get some movement due to the moisture but as the game passes, it will be difficult for the bowlers. Dew will be an important factor on this ground. Highest total on this ground is 203/8 in 19.4 overs by ENG v SA. In Mumbai today it will be a sunny day with clear sky. Cricket fans will get a chance to watch the full match as there is no sign of rain. The temperature is expected to be 31-Degree Celsius and humidity to be 61% which may go up to 70%. You will be surprised to know that in last five matches MI has only won one match whereas SRH has won 4 matches out of 5 games. It will be interesting to see how Rohit will take this challenge as in IPL 2018 they have only won one match and they will be desperate to improve this result. Evin Lewis, Ishan Kishan (wk), Suryakumar Yadav, Anukul Roy, Mustafizur Rahman, Rohit Sharma (c), Tajinder Singh, Kieron Pollard, Aditya Tare, Krunal Pandya, Pradeep Sangwan, Mitchell McClenaghan, Sharad Lumba, Hardik Pandya, Rahul Chahar, Mayank Markande, Ben Cutting, Jasprit Bumrah, Siddhesh Lad, Mohsin Khan, Saurabh Tiwary, Adam Milne, Akila Dananjaya, Jean-Paul Duminy, MD Nidheesh. Kane Williamson (c), Manish Pandey, Shakib Al Hasan, Billy Stanlake, Wriddhiman Saha (wk), Mehdi Hasan, Shikhar Dhawan, Basil Thampi, Alex Hales, Bhuvneshwar Kumar, Bipul Sharma, Deepak Hooda, Rashid Khan, Shreevats Goswami, Yusuf Pathan, Chris Jordan, K Khaleel Ahmed, Siddarth Kaul, Sachin Baby, Tanmay Agarwal, Mohammad Nabi, Ricky Bhui, T Natarajan, Carlos Brathwaite, Sandeep Sharma. In 2015 MI have lost their first 4 matches but at the end, they have lifted the cup and they are hoping the same in this IPL also. Rohit Sharma has to take responsibility if they want to repeat 2015 season. SRH lost their last two matches and they have slipped from the top. It is a difficult situation for Mumbai Indians as their middle order batsmen are not performing. This is the third time that they lost a match in the final over. Their death bowlers are not performing at their best. Rohit has to come up with the plan. We don’t think MI will make any change in their playing 11. Evin Lewis, Rohit Sharma (c), Suryakumar Yadav, Krunal Pandya, Ishan Kishan (wk), Mustafizur Rahman, Kieron Pollard, Mayank Markande, Hardik Pandya, Jasprit Bumrah, Mitchell McClenaghan. Bhuvneshwar Kumar will not play today’s match as he didn’t travel to Mumbai. He has been rested. Already SRH batting was weak and playing of Shikhar Dhawan is in doubt. He may play if he passes the fitness test before the match. If Sunrisers Hyderabad gives chance to Alex Hales they have to make many changes in their team. Ricky Bhui/Shikhar Dhawan, Manish Pandey, Yusuf Pathan/Bipul Sharma/Sachin Baby, Kane Williamson (c), Wriddhiman Saha (wk), Shakib Al Hasan/Alex Hales, Sandeep Sharma, Deepak Hooda, Billy Stanlake, Siddarth Kaul, Rashid Khan. Ishan Kishan: Ishan Kishan has scored 151 runs so far in this IPL. He has scored 58 runs in the last inning and contributed 44 points. 81.87% of the dream11 users have selected him in their teams. Wriddhiman Saha: Saha scored 62 runs in the last 5 innings. In the last match, he scored 5 runs and contributed 10.5 fantasy points. 6.24% of the users have taken him in their teams. Pro tips: Try to keep Ishan Kishan in your team. For multiple teams make a combination of the above players. Shikhar Dhawan(If he plays): In last three games Shikhar scored 129. Till now Dhawan has contributed 96.5 points. In last 9 matches, he has scored 268 runs with an average of 44.68. 34.01% of the users have selected him in their teams. Rohit Sharma: According to our prediction he will score big in today’s match. In last 10 games, he has scored 221 runs with an average of 22.10. 74.54% of the users have selected him in their dream11 fantasy teams. Evin Lewis: Lewis has scored 142 runs in last 5 innings and contributed 102.5 points. 60.83% of the users have taken him in their teams. Kane Williamson: Most consistent player of this IPL. Williamson has scored 230 runs so far in the 11th edition of IPL. He has scored 84 runs in the last match and contributed 57.5 points. 88.11% of the users have taken him in their dream teams. Alex Hales(If he plays): If Dhawan doesn’t play, he may open the inning for SRH. He is a power hitter. He has an average of almost 34 runs in the powerplay. 2.34% of the users have selected him in their teams. Manish Pandey: Manish Pandey hasn’t performed till not except one game but he has the potential to score big. Till now he has contributed 60 points. 40.05% of the users have selected him in their teams. Suryakumar Yadav: Most valuable player as he is performing consistently. Till now he has scored 196 runs. He scored 72 runs in the last inning and contributed 52 points. 75.99% of the users have chosen him in their teams. Pro tips: Dhawan and Hales has a less chance but you can keep one player in the grand league as anyone can play. For multiple teams make a combination of the above list. Krunal Pandya: In last five innings Krunal has scored 89 runs and took 6 wickets. He scored 7 runs, took 1 wicket in the last inning and contributed 20 points. 79.28% of the users have selected him in their dream11 teams. Shakib-Al-Hasan: Shakib has scored 89 runs and took 5 wickets in last 5 matches. He scored 24 runs in the last inning and contributed 16 points. 76.76% of the users have chosen him. Hardik Pandya: Hardik scored 45 runs and took 5 wickets till now in this tournament. He scored 4 runs and took 2 wickets in the last inning and contributed 31.5 points. 51.29% of the users have taken him in their teams. Pro tips: Make a combination of the above players as all three players are good. Shakib may be rested if Hales plays. Jasprit Bumrah: So far Bumrah took 7 wickets in IPL 2018. He took 2 wickets in the previous match and contributed 22 points. 66.4% of the users have selected him in their dream 11 teams. Rashid Khan: Rashid was not that effective this season but he can dismiss big players on any given day. Till now he has contributed 67 points. 55.04% of the users have selected him in their teams. Mustafizur Rahman: Mustafizur took 6 wickets so far in this season and contributed 74 points. 27.02% of the users have taken him in their teams. Mayank Markande: Markande is one of the top wicket-takers of this IPL. He took 8 wickets so far in this season. 40.19% of the users have picked him in their teams. Pro tips: Make a combination of the above players. You can also keep players from key players. Pro tips: The above players are most likely to perform you can keep them as captain and vice-captain. Mumbai Indians record is not that good against Sunrisers Hyderabad but in today’s match, the story is different as SRH key players will not play. On paper MI looks very strong and as they are playing in Wankhede their winning chances increases. According to our astrology prediction, MI will win today’s match. Dew plays an important role in Mumbai so the team winning the toss may want to bowl first. If you go by our prediction SRH will win the toss and they will ask MI to bat first. If Mumbai Indians wins the toss they will also bowl first. Try to select in form batsman as this pitch will be a batting-friendly pitch. Make a balanced team with pinch hitters. Take smart bowlers in your team. Bumrah is most suitable, so try to keep him. Ishan Kishan is the best choice for wicketkeeper as he will bat at one down. Conclusion: This is it for Today’s Dream11 Fantasy Cricket Match Prediction of MI vs SRH, 23rd T20 Match, IPL 2018 which will be played on Tuesday 24th April. You can give your valuable feedback in the comment section. Subscribe to our notification of latest updates. GOODBYE! Hey, Prem due to some technical problems we couldn’t upload the content. We are working on that and most probably you will get the updates. Thank you for your support.